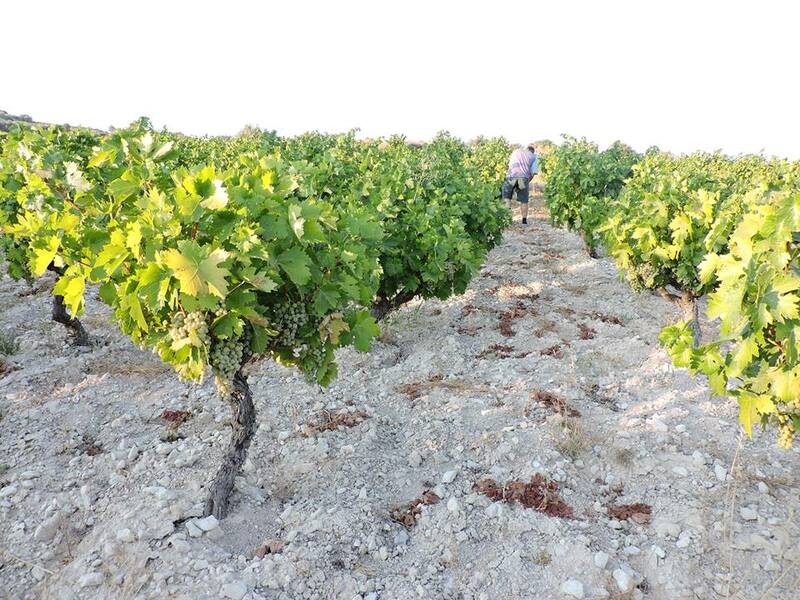 While the wines of Cyprus are slowly unfolding their ''indigenous'' personality to the markets, many discussions have arisen concerning the regional styles of its main variety, Xynisteri. 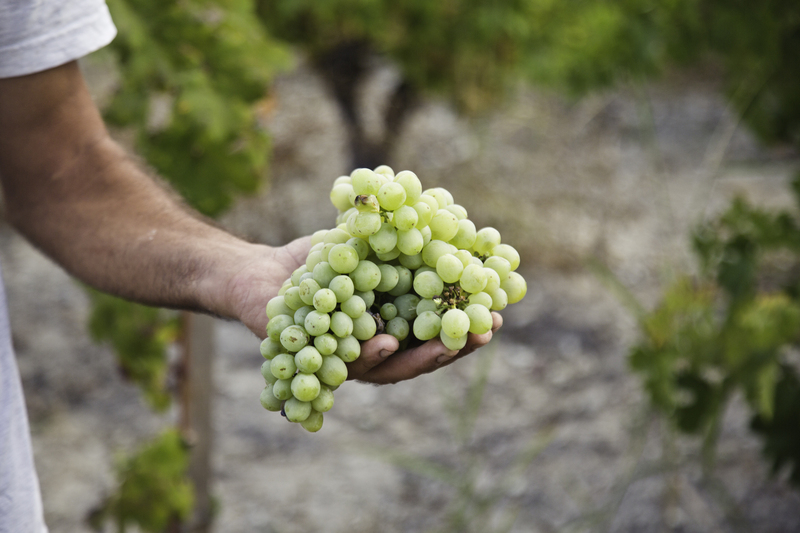 According to Wine Grapes Xynisteri can be considered indigenous to the island of Cyprus, where it was first mentioned as Xinisteri in 1881 and was placed among the better quality wines of the island. Several years later, in 1893, a French ampelographer refers to Xynisteri as the best and most widespread variety. Fast forward 124 years later and Xynisteri retains both its prime position in terms of plantings and its quality perception. Xynisteri, with its 2.410 ha, covers approximately 20% of the total plantings of Cyprus and is the most planted white variety. It is second, over all, following Mavro. It is a zesty variety full of freshness and delicacy. The name, which translates as sour in Greek, is, more or less, a euphemism, since, in reality, Xynisteri lacks acidity. Nevertheless, with a little help from higher altitudes and a little fine tuning during wine making, it manages to give balanced wines with spotless, delicate fresh fruit, in the stone fruit aromatic spectrum, complemented by herbal or floral nuances. The wineries of Kyperounda, Tsiakkas, Zambarta, Vouni Panagia and Vassiliadis Expressions produce some of the most charming examples of the variety. But, what about regional styles? What are the differences between Xynisteris grown in the western part of Cyprus, in Paphos, vs those grown in the central part, in Krasochoria or Pitsilia? Getting under the skin of a variety and unfolding its diversity and the multiplicity of its expression always excites me. During one of my last visits to the gorgeous island of Cyprus I had fascinating and extensive discussions about the styles of Xynisteri with key players of the Cypriot wine industry, ie. wine makers Sofoklis Vlassidis, Marcos Zambartas and Minas Mina (Kyperounda) and sommeliers George Kassianos and Vassos Manoli. The conclusions are noted below, although I plan to taste more Xynisteri in my upcoming trip, to further confirm my original impressions. Paphos region: Laona Akama including Kathikas village (northwest of Pafos ) is situated at 400- 650 m, is comprised mostly of limestone soils, and receives 610 mm of rain per year; the climate is temperate. The wines have a distinctive saline character possibly because of the combination of sea influence, limestone soils and high altitudes. East of Pafos lie two more subregions: the lower lying Diarizos valley west/southwest of Troodos mountain, that produces fruity and forward Xynisteri due to the alluvial deposits of the rivers, and the more complex sedimentary and igneous soils; the higher altitude vineyards of mountainous Vouni Panagias - Ambelitis (that rise up to 1144 m in steep slopes) produce more mineral and tight wines (due to the mostly clay soils in the valley, which give way to more limestone dominated soils with altitude). 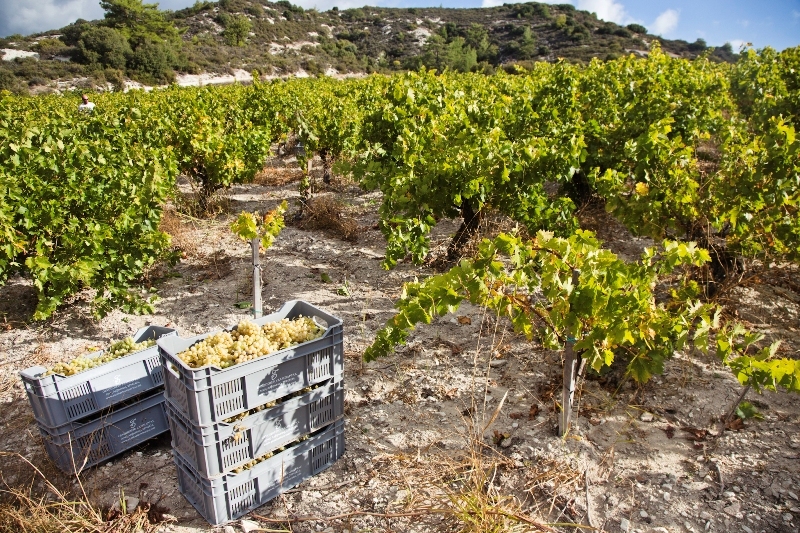 As a rule of thumb Paphos produces mineral and citrusy Xynisteri in Laona Akama and Vouni Ambelitis and more forward wines in Diarizos. Krasochoria : 20 villages located on the southern slopes of the Troodos mountain range. No other place in Cyprus has such a great presence of wineries. Collectively, the villages are known as ‘Krasochoria’, a name which is a compound of the two Greek words for ‘wine’ and ‘villages’ and encloses their rich winemaking tradition. They start at 600 m and rise up to 1100 m, soils are shallow composed of high percentage of gravel and limestone (pictured below at Vlassidis vineyard-600 m altitude). At Krasochoria, grassy Xynisteris are produced in a mineral and less fruity style compared to Paphos. Pitsilia: Rugged landscape with viticulture on the edge. 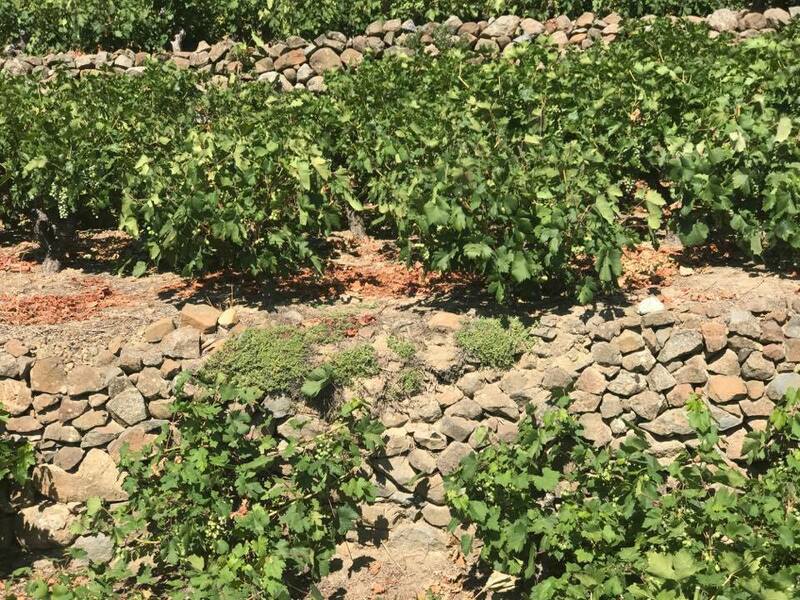 11 villages, nestling below three mountaintops – Olympus at 1,950 m, Madari at 1,600 m and Papoutsa at 1,400 m. Soils are igneous (ophiolyte) with high percentage of sand (pictured below at Kyperounda vineyards). Wines here seem to express more body, tension and minerality. As a general comment and according to Geological Survey Department of Cyprus volcanic soils are very common in the island. Ophiolyte (types of igneous rock that are pieces of oceanic plate that have been thrusted onto the edge of continental plates) dominates the central part of the island. It appears in two regions (main mass of the Troodos mountain range and in the Limassol and Akapnou Forests south of the range). Minor outcrops appear in the Akamas peninsula and in the area of Troulloi village. It was formed in the Upper Cretaceous (90 Ma) on the Tethys sea floor, which then extended from the Pyrenees through the Alps to the Himalayas. It is regarded as the most complete, intact and studied ophiolite in the world. It is a fragment of a fully developed oceanic crust, consisting of plutonic, intrusive and volcanic rocks and chemical sediments. Xynisteri seems to have found itself a suitable home in the arid, limestone and volcanic terroirs of the island. Higher altitudes favour the production of more tight wines while volcanic and limestone soils do seem to provide backbone, structure and energy to the wines. Terroir discussions will definitely spark more interest in the variety and may well help elevate quality to higher standards.